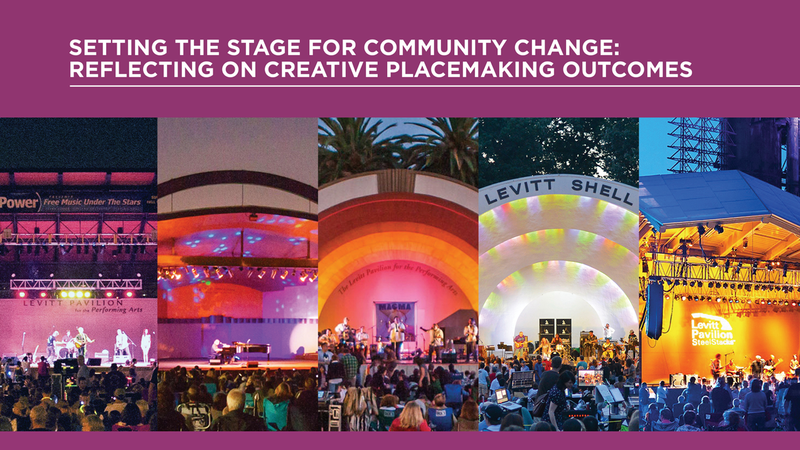 As interest in measuring and understanding the impact of arts investments in community development continues to grow, a new study released in November, Setting the Stage for Community Change: Reflecting on Creative Placemaking Outcomes, offers insights for the field of “creative placemaking” and is a working illustration of what can and can’t be learned from different impact measurement approaches. Commissioned by the Mortimer & Mimi Levitt Foundation and led by Slover Linett Audience Research, the multi-year (2013–2016), mixed-method study was designed to explore whether and how permanent outdoor Levitt music venues are bringing about change in the communities in which they operate. 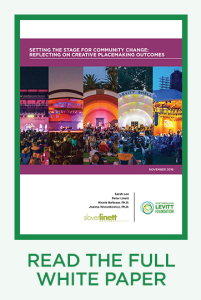 The findings about Levitt venues, and the mechanisms by which they affect individual concertgoers and the broader community, offer insights into arts-based strategies to promote social connectivity, a central goal of many creative placemaking efforts. Through its support of creative placemaking, the Levitt Foundation empowers communities across the country to revitalize underused public spaces through free live music, including the development of outdoor music venues, each providing 50 free, professional concerts to the community every year. Levitt venues—each managed, programmed and supported by a Friends of Levitt nonprofit organization—share a common mission to strengthen the social fabric of their communities by invigorating community life and bringing people together of all ages and backgrounds. The new study sought to examine the social impact of these venues and to further the dialogue on how to measure the outcomes and impact of creative placemaking interventions. 3) Pre/Post Outcomes Study, also by Slover Linett, to be published in early 2019, uses primary qualitative and quantitative data collection to document changes from before a new Levitt Pavilion opens in Denver in 2017 to after it has been in operation for a full concert season. Slover Linett’s President, Sarah Lee, said she hopes the study will contribute to the field’s ongoing conversation about how to measure the outcomes of creative placemaking projects. “We looked at the arts experience itself—the free outdoor concerts at Levitt venues—and tried to understand the broader effects of that experience on the people and communities involved,” said Lee. The free Levitt concert series offer a hybrid experience of both the arts and community connection. They interweave musical, social and community elements, facilitating social interaction not only within attendees’ existing social groups, but also among people from diverse economic and social backgrounds. The open lawn setting and free admission of Levitt concerts mean that there are no physical or financial barriers to entry. This fosters the feeling among concertgoers that “all are welcome” and helps facilitate meaningful social interactions across demographic boundaries. 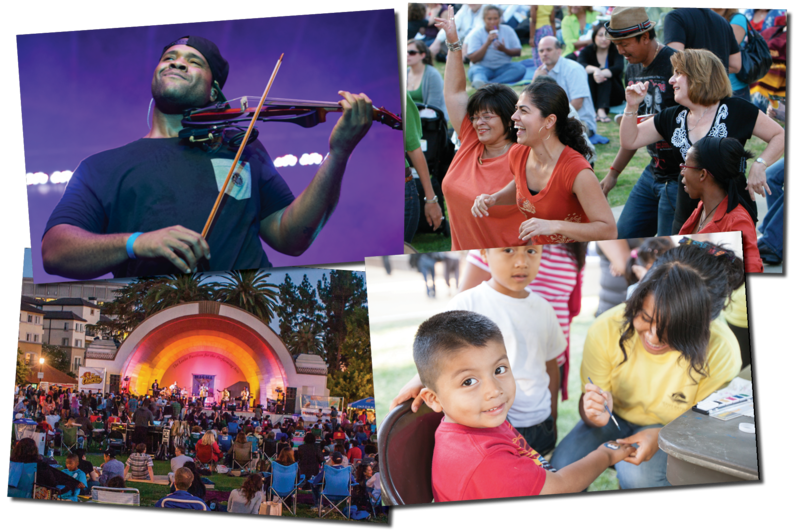 The caliber and variety of musicians performing at Levitt venues plays an important role in appealing to a diverse cross-section of their communities. While attendees may not be familiar with the particular artists performing, they have come to trust Levitt to expose them to new music and high-quality talent they will enjoy. Levitt venues are perceived to have played an important role in improved safety and the broader revitalization of their immediate neighborhood and surrounding areas. That said, the venues, while playing a catalytic and contributory role, were not solely responsible for these developments and were one among several strategies for community vitality. The study illustrates the notion that there isn’t a “one size fits all” method of assessing the success of creative placemaking projects. Fully understanding the context of a project—and its neighborhood—is key to understanding both the potential and actual impacts of a creative placemaking initiative. To understand that context, existing indicators frameworks should be combined with primary data collection efforts. Project-specific data collection efforts reveal new insights about both the efficacy of creative placemaking projects and the mechanisms by which they operate—insights that would not be reached through an indicators approach alone. The Levitt Foundation hopes the implications from this study will provide valuable guidance to a wide range of creative placemaking efforts, from music-based projects to those involving other arts disciplines and diverse community contexts, and including both temporary and long-term investments. In creative placemaking, artistic programming is as important as the setting and venue in providing a compelling and communal experience for participants. Programming can communicate subtle but important messages about who might feel welcome. The physical and logistical attributes of a creative placemaking project, such as location and space layout, establish how interactions amongst participants occur and how potential barriers to entry inform who participates and how frequently. Communicating clearly about a project’s community-building goals to participants and residents can help engage them as informal ambassadors. It is important to address the history and sociology of the community in which the creative placemaking project takes place. An in-depth awareness of a community’s latent potential as well as its challenges can help initiatives set appropriate goals and devise targeted strategies to maximize impact. Partnership, coordination and collaboration are essential creative placemaking skills to ensure that projects address the local communities’ most pressing needs and are undertaken in coordination with other community improvement efforts in order to be most effective. The new knowledge gleaned from this study has already begun informing the work of the Levitt Foundation and will continue to do so moving forward. Please share your thoughts and comments, and we look forward to continuing the conversation.